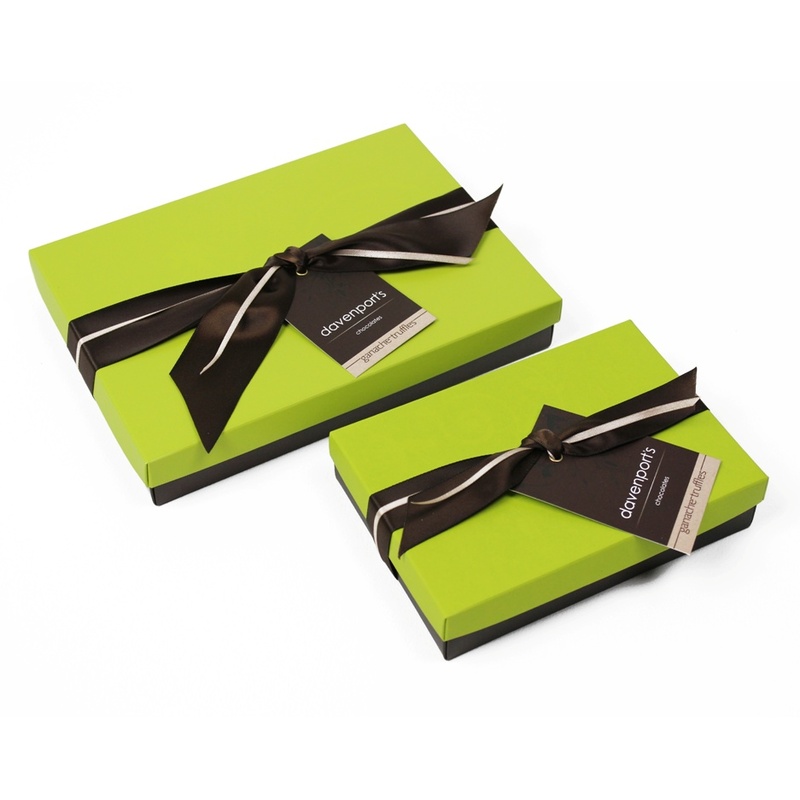 Each elegant, hand ribboned gift box contains a selection of our most indulgent chocolate Ganache Truffles. 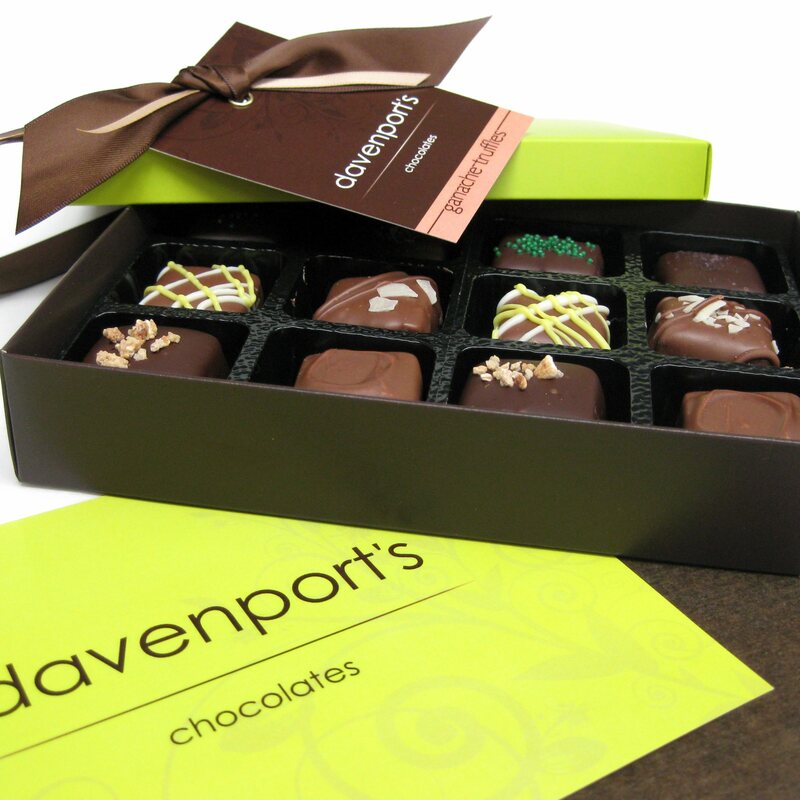 Velvety, smooth chocolate and rich, unctuous butter are folded together to create these charming and original artisan truffles; a celebration of fruits, wrapped in a warm, winter coat of chocolate. HONEY SPICE: Cinnamon, nutmeg and ginger fused with the golden sweetness of honey in one milk chocolate mouthful, reminiscent of festive German 'Lebkuchen' biscuits. CHOCOLATE ORANGE: Sweet juices and fresh zest of orange folded into a milk chocolate ganache, hand painted with a beautiful pearlescent sheen. 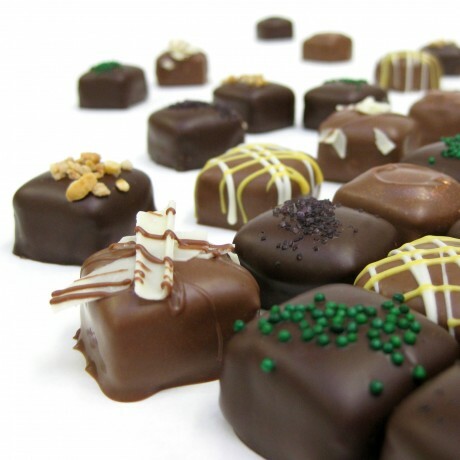 ARTISAN PRALINE: Caramelized hazelnuts, flaked almonds and smooth dark chocolate combine in this praline ganache, topped with roasted hazelnut nibs for a crisp finish. DARK BERRIES: Blackcurrant and black grape juices spiced with cinnamon, nutmeg and cloves in a rich, dark ganache inspired by the Finnish drink 'Glog'. 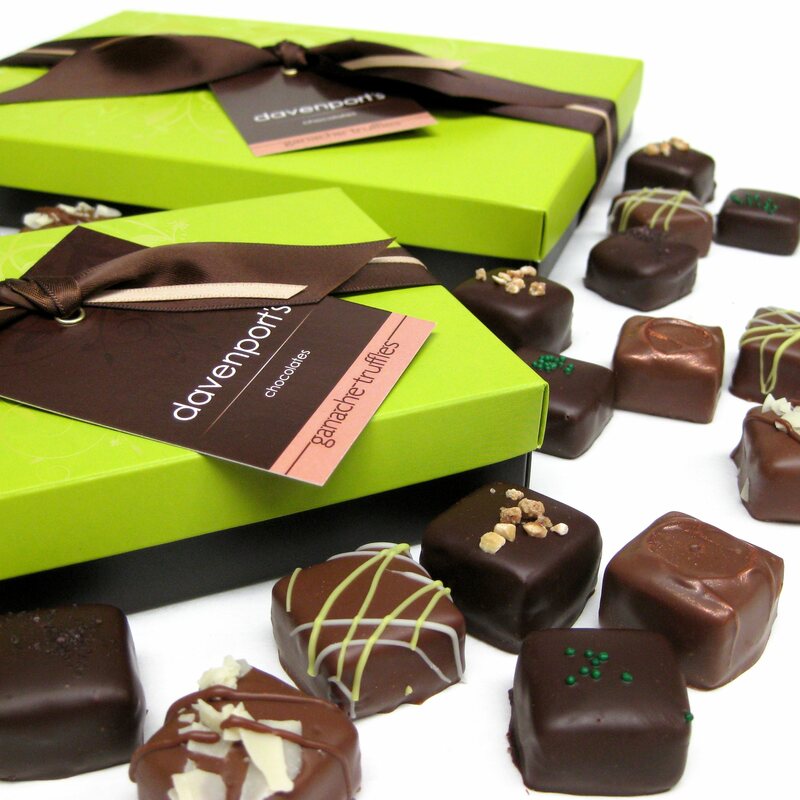 CREME CARAMEL: An indulgent caramel ganache, made from smooth milk chocolate and topped with creamy white chocolate flakes. GINGER & LEMONGRASS: Dark chocolate ganache infused with the warm depth of fresh root ginger and a subtle hint of lemongrass. Here at Davenport’s Chocolates we love making chocolates. It is our passion. It is our life. Creating chocolates that put a smile on your face, and make an involuntary ‘Mmmmm’noise is our mission. If you would like to share this chocolate experience, just click ADD TO BASKET and we will deliver it to you! Dark Chocolate (Cocoa Mass, Sugar, Cocoa Butter, Emulsifier: Soya Lecithin, Natural Vanilla Flavouring), Milk Chocolate (Sugar, Cocoa Butter, Whole Milk Powder, Cocoa Mass, Emulsifier: Soya Lecithin, Natural Vanilla Flavouring), Hazelnut Praline (Sugar, hazelnuts), Butter (Milk), Glucose, White Chocolate (Sugar, Cocoa Butter, Whole Milk Powder, Cocoa Mass, Emulsifier: Soya Lecithin, Natural Vanilla Flavouring), Crystallised Ginger (Ginger, Sugar), Orange Fruit Paste (Orange Juice Concentrate, Colouring Plant Concentrates (Carrot, Pumpkin), Natural Orange Flavouring, Ethanol, Acidifier: Citric Acid), Blackcurrant Fruit Paste (Blackcurrant Juice Concentrate, Blueberry Juice Concentrate, Natural Cassis Flavour With Other Natural Flavours, Beetroot Juice Concentrate, Ethanol, Acidifier: Citric Acid), Almonds, Honey Powder, Raspberry Fruit Paste (Beetroot Juice Concentrate, Raspberry Juice Concentrate, Natural Raspberry Flavouring, Natural Flavourings, Acidifier: Citric Acid, Ethanol), Cinnamon, Nutmeg, Cloves, Caramelised Hazelnuts, Blueberry Powder, Pearlescent Sugar Strands (Sugar, Corn Starch, Soya Lecithin, Vegetable Fat, Glucose, Maltodextrin, Carotenes, Beetroot Red, Paprika Extract, Chlorophylls, Anthocyans, Tumeric, Titanium Dioxide, Potassium Aluminium Silicate (trace), Carnauba Wax E903 (trace), Gum Arabic (trace), Sodium Alginate E401, (trace)), Lemongrass Oil, Colour Powder with Mica and E172, Natural Colour Curcumin E100. Per 100g: Energy 2105kJ/ 502.8kcal, Fat 33.5g (of which saturates 20.1g), Carbohydrates 43,1g (of which sugars 40.5g), Fibre 3.7g, Protein 5.1g, Salt 0.17g. Per 13g Serving: Energy 263.1kJ/ 62.9kcal, Fat 4.2g (of which saturates 2.5g), Carbohydrate 5.4g (of which sugars 5.1g), Fibre 0.5g, Protein 0.6g, Salt 0.02g.